This is certainly a splashy way to debut my new book, Banned on the Hill… and a real honour! Back in November, Alternatives Journal Magazine caught wind of my new book and invited me to contribute to an upcoming issue. 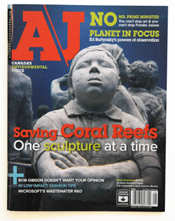 A\J, or Alternatives Journal, is Canada’s oldest environmental magazine, and is the official publication of the Environmental Studies Association of Canada. 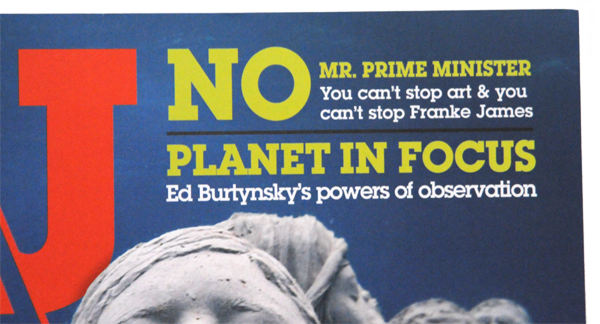 My contribution is in the May/June 2013 issue, which focuses on environmental art and activism. It’s jam-packed with fascinating articles including these: Environmental artists explore the meaning of environmental art and why we need it. Documentary filmmakers share their insights on “How to See Things.” And John Bennett, Director of Sierra Club Canada is interviewed on the thorny issue of civil disobedience. How do you decide if it’s right for you? The discussion continues online with leading environmentalists discussing civil disobedience. I weighed in too. If you know my green driveway story you may have an inkling of whether I was pro or con on civil disobedience. A/J also interviewed me for their podcast. I share the spotlight with Giles Slade, the author of Made to Break and The Big Disconnect as he discusses our disposable society — from stuff to people. When I was interviewed by Daryn Caister, I was planning on calling my new book, “Franke James is your fault?” Why did I change my mind at the last minute? Read my new book Banned on the Hill, and you’ll find out why I changed the title — and why it was the right decision. 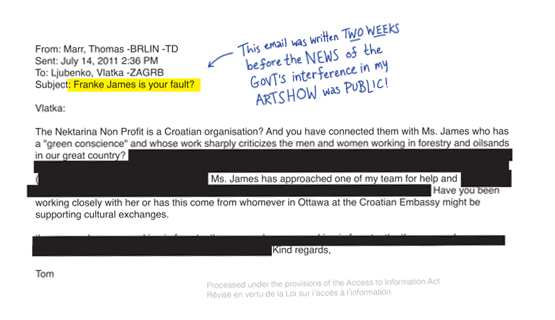 “No, Mr. Prime Minister, You can’t stop art and you can’t stop Franke James”. Visit AlternativesJournal.ca for more info.